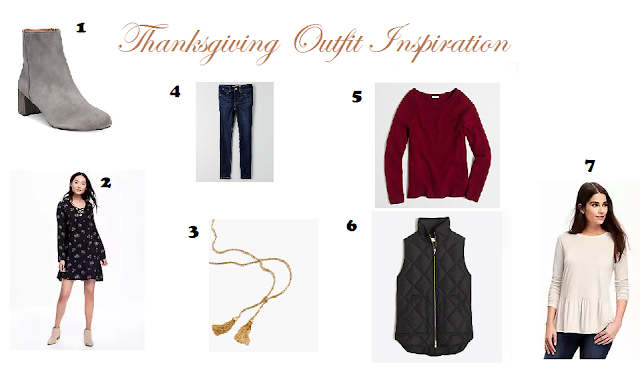 Today I am sharing some things that I think would make great outfits for Thanksgiving this year! I just ordered a few of these pieces as well and cannot wait to share my outfit next week! I'm so excited for the holidays this year, I'm usually super happy and all, but this year I'm ecstatic! I have been decorating and Christmas present shopping and writing everything in green and red pens. So, here are my top pieces for Thanksgiving! 1 - Grey booties, these ones are super cute from Macy's, but just in general I think any booties would make a super cute outfit addition! 2 - Flowy lace up dress, this really pretty dress is from Old Navy and is a great price! I love patterned dresses for Thanksgiving for some reason they just seem so perfect for this holiday. 3 - Gold Tassel Necklace, I am obsessed with tassel necklaces and this one is totally on my wishlist! 4 - My Go To Jeans, all year round these are my go to's when I want pretty classic looking jeans, so surprise I'm thinking about wearing these for Thanksgiving too! 5 - Maroon J Crew Sweater, I love this J Crew factory sweater paired with a black puffer vest (like the number 6) such a pretty fall color. 6 - Black J Crew Puffer Vest, I have this J Crew factory vest and love it, it's nice and thick and the perfect addition to an outfit! 7 - Peplum Oatmeal Top, This is such a cute shirt! It could be paired in so many cute ways, dress it up with a skirt or dress it down with jeans and cute booties/.